Homemade Soymilk is a really rewarding drink to make at home. It's not as hard as one would think as long as you have the right equipment (ie. 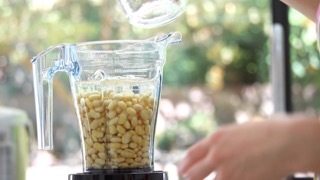 blender and cheesecloth or nut bag strainer). My favorite way to serve soy milk is HOT in a bowl, just like they do in Taiwan. Every once in a while, I'll like to have this with Chinese doughnut and dip the doughnut straight into the bowl. I also recommending using organic soybeans if you can, as I didn't see too much of a price difference when buying the organic ones. The organic beans also looked to be better quality. Did you know? You can use this soy milk as a base to make tofu and also sweet tofu desserts! The grounds can also be composted and used for cooking in other dishes. *Prep: Soak your soybeans overnight before cleaning and removing the skins. Note estimated prep time does not include soaking.